So, you like web magazines? You believe paper will become obsolete, resulting in acres of beautiful forest? Well, forget it. Go get a ream, and let's waste it with idle mathematical diversions. It's time to learn the ins and outs of paper folding. People have been folding paper for centuries. Not long after paper was invented in China, the Chinese were folding it. In Japan it became the art of origami, first practiced only by the elite, and then by the masses as paper became cheap and abundant. The patterns used to fold square sheets into representational figures propagated as oral traditions for centuries, though only a few simple designs survived to the earliest printed works. The best known origami design is the crane, and in fact the oldest surviving book on origami is the Hiden Senbazuru Orikata (How to Fold One Thousand Cranes). 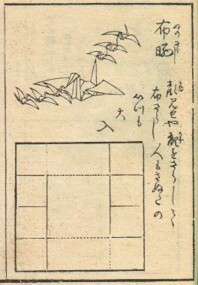 The book begins with basic instructions for folding the origami crane. With beautiful calligraphy and illustrations, it then shows dozens of ways to fold many cranes from one sheet of paper. In these multi-crane folds, the sheet is cut into small squares which remain joined by thin strips at the corners. Then the dexterous artist folds the individual cranes without tearing the strips. Hiden Senbazuru Orikata, page 15-2. The dark cuts divide the square into one large square for the mother crane and six smaller squares for the children. Notice the cuts do not quite separate the squares. Traditionally a symbol of long life, fidelity, and peace, the crane took on new meaning after World War II. In the 1950s, leukemia was so common among survivors of Hiroshima that it became known as the "A-bomb disease." One two-year-old, Sadako Sasaki, had survived the blast but ten years later was dying from the radiation. In her hospital bed, she set out to fold one thousand cranes as a wish for world peace, but died having only finished 644. Her tragic story was popularized in the children's book Sadako and the Thousand Paper Cranes. Each year, the story inspires children to fold paper cranes and send them to Japan, to be placed on Sadako's monument in the Hiroshima Peace Park. It's time to get in the paper folding spirit. Find (or cut) a piece of square paper, and fold a crane yourself. Try these PDF instructions, or see an animated version at the Origami Museum. The crane is a masterpiece of elegance, with symmetry slightly broken by the beak, and a remarkable final puff of air required to inflate the body. Now fold 999 more, and maybe the world will find peace. The crane is not too difficult, but has a tricky step or two. When I was a kid, and not up to folding cranes, I made origami pigeons, and lots of them. In fact, I made a whole box of origami pigeons, and dumped them off the second floor landing in my house. And you know what? Origami pigeons don't fly at all. The classic "dart" model paper airplane does fly. Even if you're just skimming along here, you've got to make at least one of these. Especially if you're reading this when you should be working. Having folded a plane and a crane, you're ready to try some paper folding puzzles. For these, you need a square sheet of paper which is white on one side and colored (or printed on) on the other. Fold it into a smaller square so that the colored side makes the pattern shown on the left. This can be done with only two folds. Now, try the middle patterns. Each takes three folds. After these warm ups, try the pattern on the right in 4 folds. Be warned -- this one is considerably harder. There are more puzzles like this on Tom Hull's origami puzzles page. Folding paper is a very simple operation, but leads to surprisingly precise constructions. For example, it's easy to make a right angle using just two folds, even with a rough cut piece of paper. Just fold it once anywhere, then fold again at a right angle, lining up the two halves of the first fold to make sure the angle is perfectly 90°. To solve the first three pattern folding problems, you needed to make a fold exactly 1/5 of the way along an edge. 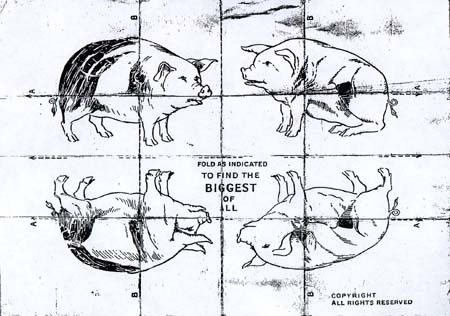 For the puzzles, it was fine to eyeball it, or to use a ruler, but could it be done accurately with only paper folds? Dividing an edge into four or eight equal sections is easy. Five might seem impossible, but it's not! First, fold five equal sections (of any length) along one edge of the paper. Then, fold a diagonal from the fifth mark to the opposite corner. Continue making parallel diagonal folds, and in the end, the folds have divided the top edge into five equal pieces. The same technique would divide the top edge into any number of equal parts. Constructions like these are reminiscent of high school geometry, where you used a straightedge and a compass to construct parallel lines, triangles, and other geometric figures. Surprisingly, paper folding can accomplish a number of constructions that the ruler and compass cannot. The paper starts with a line drawn, giving an angle with the bottom edge. Make two horizontal folds to give the two evenly spaced horizontal lines. Fold the corner, placing the black dots on the lines as shown. Mark the position of the white dot. The line through the corner and the white dot cuts the angle into two pieces, the smaller of which is exactly one-third of the original angle. Many other constructions, impossible with compass and straightedge, can be done with origami, and the discovery of the angle trisection in the 1980s stoked a new interest in origami among mathematicians. The mathematicians care the most about one question, the same one that plagued the Greeks with their compasses and rulers: which constructions are possible? All the really good constructions match stuff on the top sheet of a fold with stuff on the bottom, like we did in the second step of the angle trisection. This powerful matching step comes at a price -- it's so flexible that it is hard to describe mathematically. And, lacking even a good description of the basic maneuvers, it's hard to attack the big question. In fact, nobody knows the limits of these mathematical origami constructions. But maybe that's no surprise -- it took 2000 years, from the Greeks to Galois, to fully understand the straightedge and compass! The myriad shapes an origami artist can create are a testament to the complexity of paper folding. Certainly, anyone who has struggled to refold a road map would agree. The complexity of folding, even with a pre-creased sheet of paper, lends itself to many puzzles and amusements. Here is a more challenging folding puzzle, created by Scott Kim. Make or print out a sheet of paper, colored (on both sides) as shown. (Click the image for a printable PDF version). By folding on the lines, collapse the sheet into a 2x2 square showing all four green squares on one side. Try again, and get all four yellow squares to show. Blue is tricky, and red is the hardest. 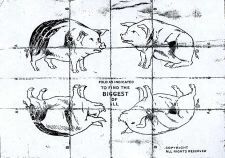 One WWII era advertisement showed Hitler, Mussolini, and the Japanese commander Tojo in three of its squares, with jail bars in two others. To try the puzzle, cut out the square, crease on the lines, and then cut out the spaces between the jail bars. Your goal is to fold it into a one-square packet so that both top and bottom of the packet show an Axis leader peering through bars. This is harder than it looks, and requires a "tuck" at the end. In the 1930s, the well-known mathematician Stanislav Ulam posed the "map folding problem": Given a sheet of paper creased into a pattern of squares, how many ways are there to fold it into a packet the size of one square? To understand the illustration, assume the front and back of the strip are different (one has pictures, the other has glue), and the left and right of the strip are different (since as shown, the faces all point to the left). Once folded, by turning the packet you can always get the leftmost stamp facing upwards and to the left. The picture shows a side view, where the mark is on the front face of the leftmost stamp. There is no known formula for these numbers, which means they remain mysterious. This was supposed to be an easy step towards the map-folding problem, so it's no surprise that map folding is poorly understood. Crease the lines, and fold the sheet into a one square packet. Reading letters off the squares from the top of the packet to the bottom, every folding spells a nine letter word. The challenge is to spell each of eight aliases of Beelzebub: BUB BEELZE, BUZ LEBEEB, ZEL BEEBUB, ZEE BUBBLE, UBE BLEZBE, BUB ZELBEE, BUB BLEZEE, and BEL ZEEBUB. Finally, you are ready to tackle the most difficult and sinister, and spell the name BEELZEBUB itself. Each of the nine names needs a different trick, and completing all nine will leave you with no doubt that finding all possible foldings is a difficult task. It's an amazing fact that even for this simple 3 x 3 map (with 9 squares), nobody has been able to count the possibilities! On the backs of two transports rise cubical shapes like thick decks of cards. Giffey is a little awed by this, at the same time his estimate of their chances rises enormously. 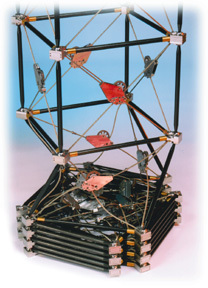 These are flexers, adaptable shapers with hinged card-shaped components. They can become almost anything, perform almost any task, go almost anywhere. Folding stuff is an old, old craft, but is rapidly becoming a new science. One fold that's been around for centuries is the bellows, used in old-style cameras and as wind power for accordions and church organs. Most bellows use the classic single fold, and a quick look at the right chat room confirms that wear and tear on bellows creases is a major issue in organ restoration. Using only elementary trigonometry, MIT graduate student Nathan Kane invented a new, optimized bellows. It's more complicated than the old-style fold, but beats the single fold on two counts -- durability and extensibility, or how far it will stretch. Folding is also the hot way to pack a large object into a small box. Nowhere are the boxes smaller than in space exploration, where big folded things are called deployable objects. Spacecraft need huge solar panels for power and long masts for data collection, but must be launched into space on the back of small, underpowered rockets. The gear needs to be large, strong, ultralight, and then stowed into tiny bins. One extending mast grows from 10 to 200 feet, and was sent into space on NASA's Shuttle Radar Topography Mission -- the "mission to map the world." Chuck Hoberman is the unquestionable master of deployment. 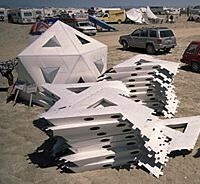 This architect/engineer uses scissors joints (just like a pair of scissors) to build large geometric structures, following the ribs of a geodesic dome or other mathematical surface. The scissors joints work together, allowing the structures to expand smoothly to many times their collapsed size, while the careful mathematical structure keeps the objects rigid at every stage. You may have seen his "Hoberman Sphere" in toy stores, or the 2002 Winter Olympics stage that irised open around each day's American medal winners. To really feel the power of collapsing, go on a backpack trip, and compare that geodesic tent you're lugging to the old house-shaped beasts of the '70s. Taking tents a step further, Hoberman has designed a rigid 3 person shelter that collapses to the size of a suitcase. Though not as light, it's far sturdier than a backpacker's tent, and infinitely easier to set up. A kindred spirit to Hoberman, engineer Sanford Ponder has designed a refugee shelter made of cheap foldable materials, built into an icosahedral hut. The structures are sturdy and light, and again the mathematical regularity makes them strong. From origami to maps to deployable objects, the striking common feature is the sheer complexity of folding. Trying to understand the possibilities remains an intractible problem, even in shockingly simple cases like the map with nine squares. Yet the complexity is what makes folding powerful: understand how to fold, and you can cram a 200 foot mast into a 10 foot box, or smush a stormproof shelter into the trunk of your car. Bryan Clair is a professor of mathematics at Saint Louis University. His previous publications in Strange Horizons can be found in our Archive. Solutions to the puzzles in this article. There's a bunch of origami resources at Origami USA. Thanks to origami artist Mark Kirschenbaum for the crane diagram. Mathematician Tom Hull has the definitive origami mathematics page. There's a good chapter on paper folding puzzles in Martin Gardner's book Wheels, Life, and other Mathematical Amusements. For dozens more like the Devil's Fold puzzle, go to the Complico Paper Folding Puzzles page. More details about stamp folding are online at the University of Victoria.